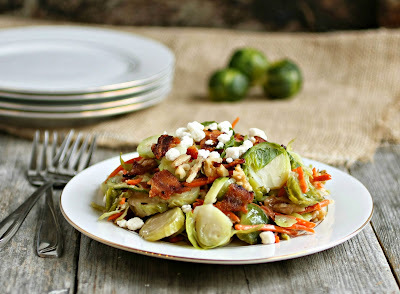 I've always been a fan of Brussels sprouts, even at a young age when most of my friends left theirs on the plate. And I learned that school cafeteria overcooking was the chief culprit in Brussels sprouts hatred. Drizzled in olive oil, well seasoned and oven roasted made for a lovely side dish that converted many folks I know. But it never occurred to me to eat them raw until I started seeing salad recipes like that. When you think about it, though, it makes sense. They're just little cabbages and most people love raw cabbage, when shredded and dressed like a coleslaw. And so I duly shredded them, dressed them, garnished and served. Um...nope, not so much. I had to admit that, even for a long time Brussels sprouts eater like myself, they were a bit much. Their natural taste is bitter and sharp, something that roasting dulls. But I wondered if a quick blanching would also be effective. Sure, there wouldn't be as much flavor as roasting but I was going to mix them with other ingredients and pour dressing over them anyway. And, happily, the quick toss in boiling water does do the trick and I found a way to make a quick, weeknight salad with these healthy little sprouts. Enjoy! 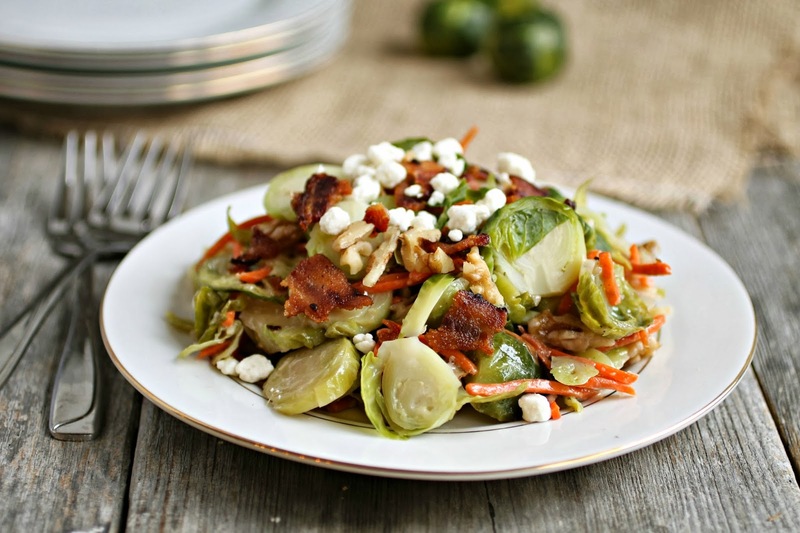 While the bacon is cooking, place the Brussels sprouts, whole, into a pot of boiling water and cook for 5 minutes. Drain and allow to cool while you gather the rest of the salad components. Whisk together all the dressing ingredients in a bowl. When the Brussels sprouts are cool enough to handle, cut off the stems and cut into halves or quarters. Add them to the dressing along with the carrots and walnuts. Crumble on the bacon and top with the cheese. Makes a single serving. This actually looks really good! I've never had brussels sprouts and always been a bit afraid of them. I'm going to change that this year. Pinned! Just the other day I was looking at brussels sprouts at the market and thinking how it's been too long since I've made them. Time for me to go back and get some. I love Brussels in any way, shape or form! Fortunately so does Simon. Your salad sounds great, Anita. Love the vinaigrette, bacon and feta! Mmmm...so delicious - one of my all-time favorite meals! Sounds amazing!!! Need to make this soon! 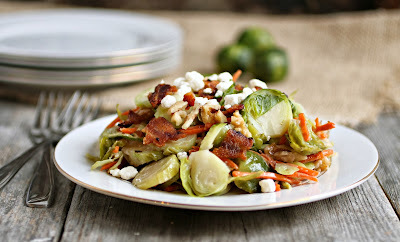 I love brussels, and this looks delicious! Bravo, Anita.